Long before Presidents had code names, August Vollmer let people know, â€œI would rather be a policeman than the President.â€ Words oft considered, and words found to be true for many, particularly those who have served the LAPD and elsewhere in law enforcement. Regardless of position, whether elected to run the country, or appointed to serve the citizenry as a police officer, the two worlds occasionally overlap. Anyone who was driving on or near the freeways during President Obamaâ€™s (code name Renegade) recent visit knows this. Besides the less public roles the Department played during last monthâ€™s visit, freeway overpasses were posted with motor officers. Their presence, both dignified and obvious, represented part of a significant operations plan which included a heavy deployment of officers. The many members of the Department serving that day can pride themselves on being part of a Presidential protection detail, and they can be proud that they, too, are part of a rich history of visits from the countryâ€™s CEOs. About three years ago, the Historical Society completed a project with the students of the Wilson High School police academy magnet program. Their work, a photo array of police officers and Presidents, remains on display at the museum. With the recent visit of the nationâ€™s current Commander-in-Chief, interest in the subject has risen greatly. Accordingly, the Historical Society dug deeper into the archives and discovered some material worth sharing. Without a doubt, the Department committed a considerable amount of resources to the visit. 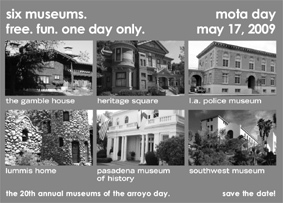 Some of the Historical Society records indicate that other visits required more personnel and more elaborate planning. We know from newspaper accounts that the entire Department was detailed to the first Presidential visit. William McKinleyâ€™s visit here in 1901 marked the first time a President set foot in Los Angeles. The Department numbered scarcely more than 100 at the time, and all of them worked. The police officers of the time are depicted in their stovepipe hats. The bosses are wearing the flat ones. When President Woodrow Wilson made his 1919 visit, an officer walking with the President was captured in his summer woolens. The deployment for that visit was outlined in the September 18, 1919 Daily Bulletin. A sizable portion of the Department was on duty, and their postings were called out in the Bulletin. Chief Home and his mounted officers led the parade. President Wilson fell ill shortly after his visit and was rarely seen publicly anymore. 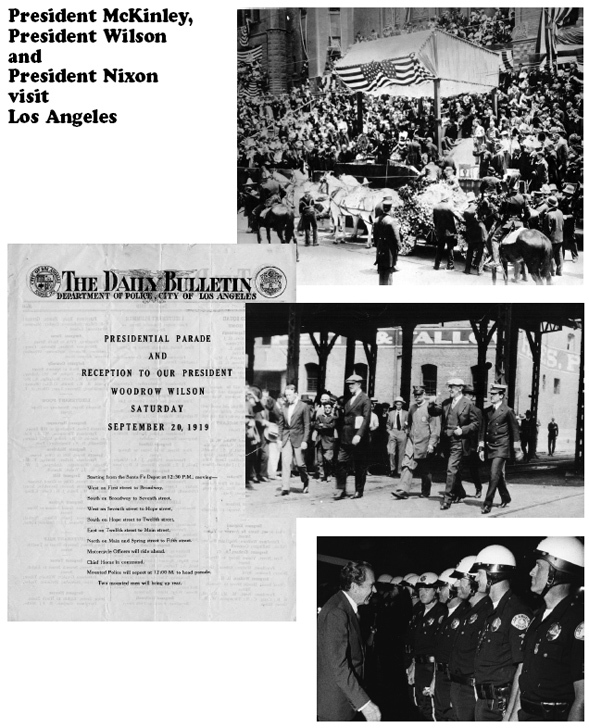 The huge police contingent assigned to the visit of Wilson was surpassed nearly a half-century later when another President came to town. 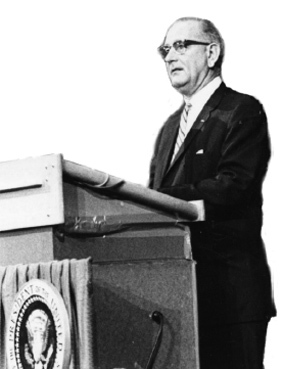 The 1967 visit of Lyndon Baines Johnson was significant for a number of reasons. This was an early deployment of the volunteer SWAT detail. These pioneers were deployed at LAX and in the Century City complex. Their presence is one of importance, not just in terms of securing the President, but in the evolution of SWAT. SWAT was joined by more than 1200 other police officers during the LBJ visit. 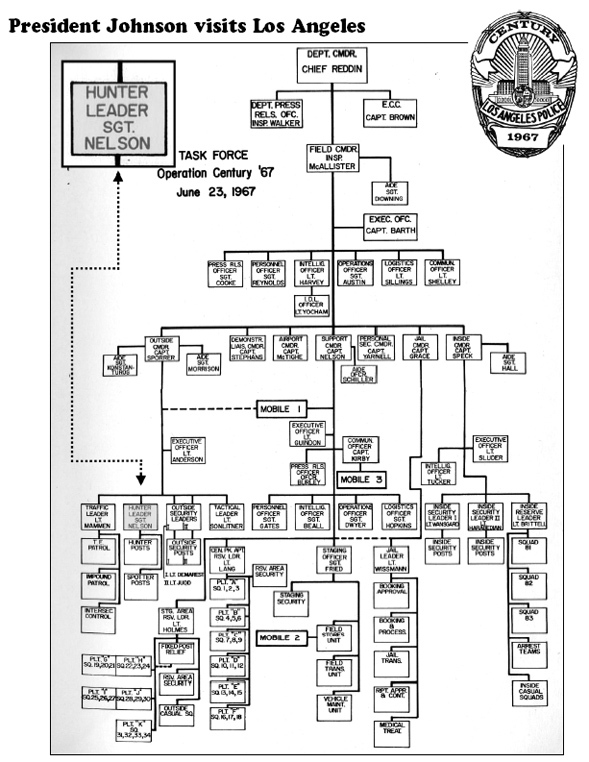 The SWAT presence is noted in the org chart element entitled â€œHunter Leader.â€ We have highlighted the component for easy reference. As a result of the mass deployment the 14,000 protestors were held at bay and the Departmentâ€™s Presidential protection obligations were clearly fulfilled. The operations plan for this visit was dubbed â€œOperation Century 67.â€ The Historical Societyâ€™s collection includes this plan. The two-hundred pages of this document cover the many moving parts necessary to ensure the safety of â€œVolunteer.â€ The preparation of the document was a great undertaking, and far more detailed than its 1919 counterpart, which numbered a total of three pages. Regardless of size, these documents are key pieces of the Historical Societyâ€™s holdings. Each allows us to assist in a small way when the President comes to town, and the Department commences to calling. Now that we have shared this material with the Department, we thought the stories of protecting Presidents of the past should be shared with our members. Recently, installation of memorial bricks, honoring each of the 202 line of duty deaths was completed at the museum. Offset from the remainder of our evergrowing brick wall, is the grouping of the new bricks. 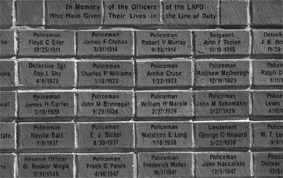 The top row contains the wording from the original police memorial monument, â€œIn honor of the Officers of the LAPD Who Have Given Their Lives in the Line of Duty.â€ Just beneath these three title bricks, the earliest line of duty death is listed. Clyde May, killed in 1907 was the first of these recorded deaths. The bricks continue in chronological order, concluding with the two officers most recently killed, Randy Simmons and Spree Desha. memories from his 60 years of association with the LAPD. Dr. and Mrs. Paul Toffel will host the event at their beautiful home in the foothills. There is still time to make a qualifying contribution. We are always looking for new partners to join us in the Chiefâ€™s Circle. As preparations for both of these great days have been progressing, we have also received some great donations. Angie Souza, widow of D-III Glenn Souza, recently donated Glennâ€™s significant book collection. The Historical Society now has a great new resource from the literary arena. This contribution includes books written about the LAPD, or written by LAPD officers. Bob Souza, himself an active Department retiree, transported the collection to the museum. To both Angie and Bob, we gratefully acknowledge and thank them for their thoughtfulness. Another, freshly retired detective, Lou Koven stopped by as his career wound down. Lou donated a vintage, framed baton, which is a great addition to the museum collection. The baton was accompanied by some old training bulletins related to his specialty, auto theft. We thank Lou for his donation and wish him well in retirement. Both of these donations are representative of what has helped us grow and develop. Over time, many retirees have shared with us unique documents and artifacts. These materials help us with many of our undertakings. In the event any of our readers are interested in contributing material to the Historical Society, please phone us at (323) 344- 9445.